very bad mobile. you cannot make your own configuration setting. and the software is slow and weak. some message cannot be deleted. mostly all s4o phones of nokia since 2008 are bad. phone like nokia 5130c, 2730 and others have doftwaer problem...mine got corrupted and i dont know wat to do... now they are all dead..
Got this phone as a cheap replacement while my smartphone is being repaired. So far i'm quite happy with it, its small and light and although its a little creaky in some places the overall build quality is ok and it feels like it will withstand stress of everyday use. Cell reception and call quality is fine and battery life is good too. I'm a music lover and the fact that this cheap handset can handle my 32gb micro sd card full of mp3s is awesome. Sound quality is also surprisingly good too, the loud speaker sounds ok and playing music with my headphones plugged in is very nice indeed. I bought nokia c2-00. It is good but when open file< my photo> automatic creat temp file in memory card. Need answer, 30 Dec 2011Does this phone can play youtube videos????????? Reply mustYou can play youtube video in c200 with softwares , like bolt browser. In this browser u can play youtube video. This Phone has got deadly hearing speaker,. its not good at all.. the manufacturer has to have to modify the hearing speaker, so that it hears clearly while speaking. Nokia c2 is low price.but photos and videos are very delay .no photo clarity.but zooming is v.gud.downloading is very dull.some times c2 is hang and switchedoff.so plz dont choose netzens. Anonymous, 01 Jan 2012 applications like nimbuzz , ebuddy are not working in c200 please any one help me please.I have recently bought nokia c2 00,nimbuzz,ebuddy and all type of this applications are properly working in my phone.so,review ur network settings. amaan, 25 Dec 2011is it Dual sim ? 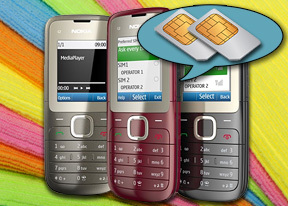 can 2 sim works at same time.. can naybody tell.. im dying to buy this Yes both sims are active in standby mode only,once you make a call/text the other sim is NOT active. So you cant make/rec call on sim 1 and rec a text/call on sim 2. I have had my C2-00 6 wks now and live in London UK and paid £47 the sims are supplied free.